Glenn Liu (Environmental Studies, ’17), is currently interning with National Park Service as a Geologist/GIS Specialist through the Geoscientists-In-the-Parks Program. The program provides both current students and recent graduates with an opportunity to work in natural resource management related projects within the National Parks. Positions are posted by the Geological Society of America twice a year, and generally last between 3 to 6 months. Spring and summer positions will be posted in December at this site. I am working at the Sandy Hook Unit of Gateway National Recreation Area, assisting Dr. Norbert Psuty of Rutgers University with collecting and analyzing data on geomorphological change, tracking the evolution of the beach-dune system with time. These components of change include shoreline position, beach topography, the morphological evolution of dune features, as well as volumetric changes in the dune, beach, and tidal flats. Determining these metrics of change provides parks managers and wildlife biologists with a quantitative means to assess beach nourishment projects for habitat restoration, allowing them to evaluate where and how quickly the placed sediments are transported. In addition to tracking changes following beach nourishment, our data also allow us to observe and document the natural evolution of the coast with time. We collect data through GPS surveys in the spring and fall to capture the seasonal response of the shoreline to weather-induced wave climates. 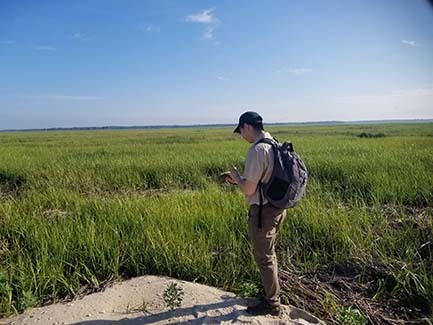 These monitoring efforts follow protocols created by Prof. Psuty and his team and published through the NPS Northeast Coastal Barrier Network, a NPS region that includes park sites from Virginia to Maine. Through this position, I have learned to operate survey-grade GPS equipment, identify and track geomorphological features, post-process field data, write python programs for analysis and visualization in ArcMap, and prepare technical reports for park resource managers. One of my favorite parts of this experience is how I can follow the data through the entire process, from collection to visualization. It is one thing to look at the data in ArcMap, and say “the shoreline at this site has moved 6 meters landward this past season”. But only by being “on the ground” at these sites and conducting the surveys, following transects that cut through the dense vegetation in Miller Field, navigating between fishermen and their gear at the swash line in Great Kills, tracing old peat edges and house foundations exposed by erosion at Moore’s Beach, do I really get a sense of the scale of change and its implications for the surrounding environment.